Samsung has stopped updating the Galaxy S6 and S6 Edge since Android 7.0 Nougat and for those of you who want to still get latest Android 8.1 Oreo + root, here’s how to do it. 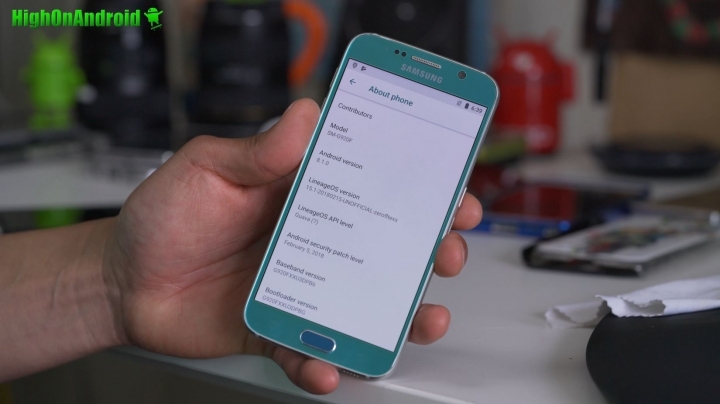 Now, this is NOT a Samsung Touchwiz firmware, rather custom ROM or AOSP(What is AOSP?) But you will get much better performance and battery life over Samsung Touchwiz plus the latest and great Android 8.1 Oreo so I don’t see why not. The NexusOS ROM comes with all the standard features of latest Android 8.1 Oreo and a few additions like Always On Display. Before we begin, PLEASE BACKUP EVERYTHING just in case things go wrong!!! You get the latest Android 8.1 Oreo! 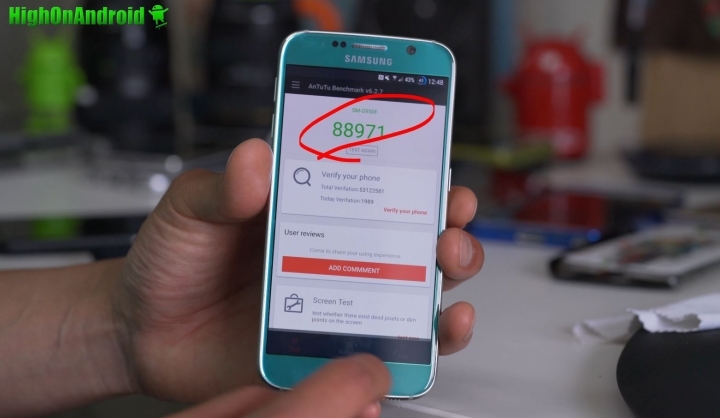 Antutu benchmarking at 88,971! Almost 20 points higher than Android 7.0 Nougat which benchmarks around 70K. Always On Display is a cool feature on this ROM although nowhere near Samsung TouchWiz. For step-by-step installation instructions, please watch the video tutorial above. But basically, you need to first turn off any security(such as fingerprint), turn on “OEM Unlock” in Developer options, flash TWRP, install ROM, install Kernel(for S6 Edge), install Gapps, install Magisk(if you want root), then reboot. Also you have to use TWRP v3.2.0+ so if you are using older version, please update TWRP FIRST! Need help? Join our HighOnAndroid telegram here. UPDATE: PLEASE DO NOT USE MAGISK V16.1, PLEASE USE V16 AS IT BREAKS PHONE CALLS. Not getting 4G LTE? Sometimes you may have to set APN manually, see How to Fix 4G LTE on by setting APN manually! Q: Is this the only way to get Android 8.0 or 8.1 Oreo on my Galaxy S6 or S6 Edge? 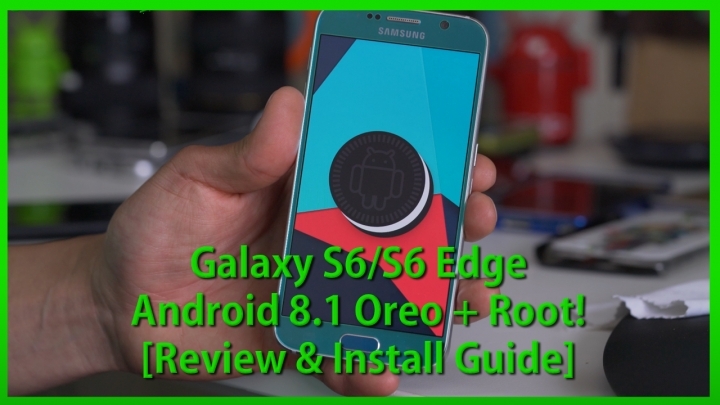 A: While there are rumors that Samsung may still update the Galaxy S6/S6 Edge to Oreo later this year, we have not received any news on this and most likely your only way to get latest Android 8.0/8.1 Oreo will be through custom ROMs such as this. Q: What are Android 8.1 Gapps for? A: Gapps are small zip file that includes Google Play Store for your custom ROM. Without Gapps, you will not get Play Store on your phone, meaning you won’t be able to download apps from the Play Store. Most people will need this obviously since they will need the Play Store to download news apps to their Android 8.1 Oreo custom firmware. However, if you don’t need it(perhaps in another country that uses something other than Play Store), you can skip flashing it. Is there any download link for beanGapps u mentioned in the video? hi sir need for sm-g925z? No, I’m disappointed in that as well!!! Where can I find Gapps for oreo? can i get link for the Nexus launcher ? and does it requires root ? See: http://apkquick.com/google-apk-files/pixel-android-p-launcher-apk/ No root required. the phone is not detecting sim card ! I’m having same issue after downloading sm-g920t. sim card not being reconized. Hi the TWRP link are not working for me I needed for SM-G925T s6 Edge Tmobile. can somebody help me??? What about Samsung Galaxy S6 edge(SM-925A) Can update to oreo? Hi is there a TWRP link for my T-mobile SM-G928T? What if the “OEM Unlock” option is not present in my Developer options? Can I humbly ask for Japanese version of S6 Edge SCV31 or G925J? Hi, does NexusOS work for the Verizon variant of the Galaxy S6 Edge (SM-G925V)? Because I can’t seem to find the version for it. How to solve it, Please kindly help. Is there an update version of the Kernel available for the new April 12 release of the NexusOS? G925W8 specifically – thanks Max for the great work! I cannot find in my developer settings the “OEM Unlock” option. Using a stock SM-G925F for now. Should I proceed with the installation? After installing on SM-G925F, i get really bad call quality. The reciever hears his echo when i put the call on the speakerphone. Searched a bit on the matter online and i’m not the only one having this issue, but I couldn’t find any solution. Can anyone help please? Awesome! Will this work on AT&T variant? SM-920A? They won’t work as they have locked bootloaders. Será que não tem para SM-G925A? 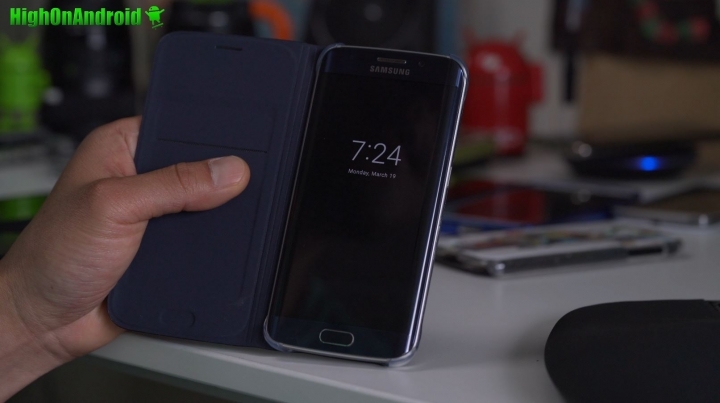 Excuse by uncomfortable, does not have version s6 edge model SM-g925a? At&t has locked bootloader, can not install custom recovery. It was now lost all … I thank you for information, thank you … does not have any option for this case? sell it buy the tmobile or international version. Can someone tell me where to find the kernel for S6 Edge SM-G925T, please??? Looking for the same, he actually used the 925T variant in the video, but I can’t find the kernel. I actually found it, he has a typo in the names here, he listed it as 920T instead of 925t. Check the name of the files and is the same he used in the video. My Galaxy S6 stuck on startup animation(color circle) after installing during first reboot. I’ve waited more than 20min. Yann your on your own its seems. At first it worked fine for like a hour then it died, now it just say Samsung. I can no Longer connect my phone to the computer ? what should I do ? mine failed. because wrong package NexusOS. i try find my package but not have in your link. my device is “zerofltetmo”. where can i get that package for my phone? now m phone cannot use. Porque no está para el SM-G925P. I want to go back to nougat. How can I do ? pq que n tem para o modelo g928g?? I have an SM-G925F but, now in the system info it appears as SM-G920F… Any idea? did anyone know where are the USB MTP options after update on SM-G920F? When the phone is locked, can’t pick a call. Also, the 3G/LTE mostimes toggle to Edge. Is there anyone experiencing this or are these errors from my end? Hi the TWRP link are not working for me I needed for SM-G925I s6 Edge Tmobile. can somebody help me??? 안드로이드가 아니라 리니지os로 설치가 됐네요. How to revert back to Stock Nougat ROM? I’m running the S6 T-Mobile variant and Odin fails every time I hit Start. Any idea what could be happening? I s there a version for the galaxy s6 G920V.07? – Fast Charge not working. Is it supported by this release? – When i have the always on display activated, i get a black screen after unlocking. I have to repeat the process multiple times until it works. – The phone properties are pointing to the model SM G920 but the phone is G925. – The camera app gets toooooo slow to take a photo. People saying they don’t have Developer Mode — pls watch the video; he shows you how to enable it at about 5 mins in. need help: I just install NexusOS ROM for Galaxy S6 SM-G920T and follow all the instructions already, all screen and program working well except the “Recent button and Back button not working” only home button are working…. any advise please……..????? Hi,i wanted to know if fast charging works on this custom rom,and also im using android 6.0.1,there is no problem if i install this rom?thank you for answering :). Hello, i got a old S6 SM-G920F, so i downloaded that OS version i also donwloaded Beans Gaps but not used yet, because when i want to install the OS i get error 7.
i wonder what is wrong since i have the right version. the mobile was already rooted. Как откатиться на заводскую прошивку? hi how r u sir i want oreo or p rom in my rooted note 5 SM-N920C plz send me the liks i am from pakistan and i leran many things with u and say u thanks for this plz reply must i am waiting sir. Can the 8.0 you are showing be installed on the S6 smg920A, it never seems to among the numbers listed with regards to downloading it on this number? Can i revert to the original software? Previous story Galaxy S9/S9+ Cases from Spigen!